Sometimes consequences don’t work because they are part of a much broader problem; the child is in a power struggle with the parents. 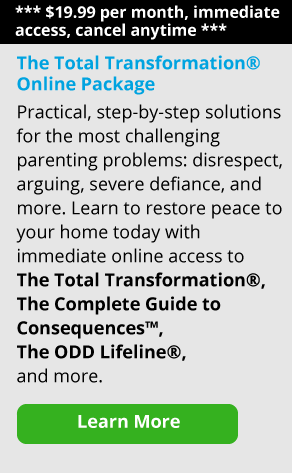 One of the primary ways that kids try to win that power struggle with their parents is by withholding compliance. Once that pattern establishes itself, the only power the parent has is to punish, and the only power the kid has is to refuse to do what they’re asked. Consequences will not work in that atmosphere. When this occurs, parents need the more comprehensive solution that The Total Transformation and parent coaching provide. The program and the support will help you with the broader problem-solving skills that enable kids to take responsibility for compliance without being reactionary.